Rumors have reached Arbitration Commentaries concerning the recent professional activities and virtual invisibility of our founder and long-time supporter Marc J. Goldstein. 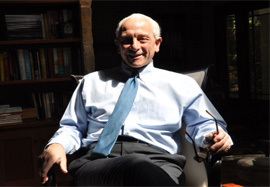 It has been said that he is locked in a consuming legal battle on behalf of a European technology client against a once-mighty and still formidable American technology colossus, that the controversy is pending in a federal judicial forum in New York, and that there is as a consequence indeed a measure of truth to the “Litigation” within Marc J. Goldstein Litigation & Arbitration Chambers. So intensive are the supposed demands of the dispute that Mr. Goldstein has reportedly declared that he must defer completion of a requested contribution to this space about the Yukos judicial annulment decision in the Netherlands, a position we can readily understand given the demands of deciphering the Dutch jurists’ exhaust(ive)(ing) analysis of Russian law in the turgid English translation presently available. It is also reported that Mr. Goldstein’s name has been restored to the Mediator Roster of the U.S. District Court in Manhattan, a roster from which he had taken leave some 15 months ago to divert energies as a mediator away from disputes between afflicted citizens and the City of New York. But alas this Roster turns out to be an online resource where disputants interested in the skill sets of mediators can find good listings of their areas of specialization, even if rather few of the commercial cases on the docket of that Court, as compared to its staggering docket of cases under federal civil rights statutes, are mediated through the Court’s ADR office. If you would like to verify any of the foregoing, Arbitration Commentaries would be pleased to contact Mr. Goldstein on your behalf.